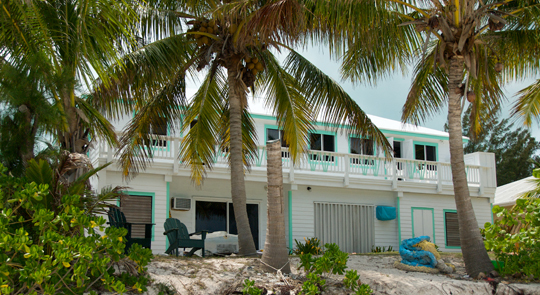 Kite Board Cottage & Bahamas Cottage.Com: Rent a beach front Bahamas' apartment and Kiteboard in your back yard! The closest rooms to the best kite-boarding beach anywhere! 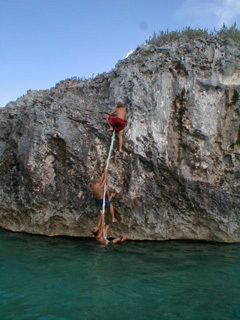 Rated 7th (of the top 12) BEST ISLAND PARADISE by Adventure magazine! 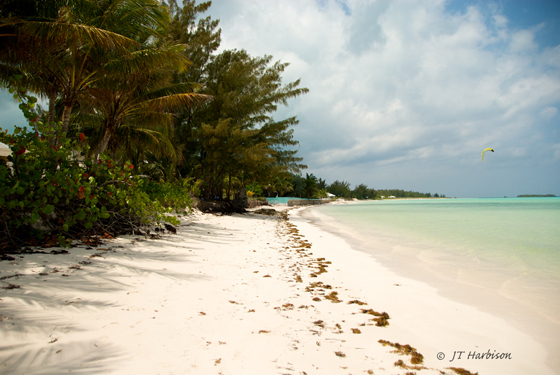 Spanish Wells is one of the nicest islands in the Bahamas (perhaps the nicest). There are NO tour buses or chain hotels. The residents tend to be honest, devout, hard working fishermen and divers who love to laugh. Crime is virtually non-existent here. Most all the residents are direct descendants of English loyalists who left America after the Revolution. The two mile island is quiet, beautiful, and friendly. Aerial shot of Spanish Wells (looking West). What makes this beach perfect for kite boarding is the great Northern wind and the amazing amount of shallow water that spans out from the beach all the way to the reef! Look at the picture (2nd from the top). It's about three feet deep all the way out until you see deep blue... that thin line near the horizon! You can jump on and off a board or wade out for over a mile in waist deep water. The clean sand bottom gives you a clear view of everything below. Kite boarders come here from all over the world because of its ideal water depth and perfect wind conditions. They put on quite a show right outside your wide glass doors! This is standing in front of the cottage on the beach, looking West. Kite Board Cottage has five apartments in a two story building facing the ocean. (It was the Spanish Wells Beach Resort until 1992.) The single unit rooms measure 15 x 28 with a kitchen and private bath. A pristine two mile beach and dramatic ocean view are right outside your door. You can fall asleep each night to the pounding sound of the surf. 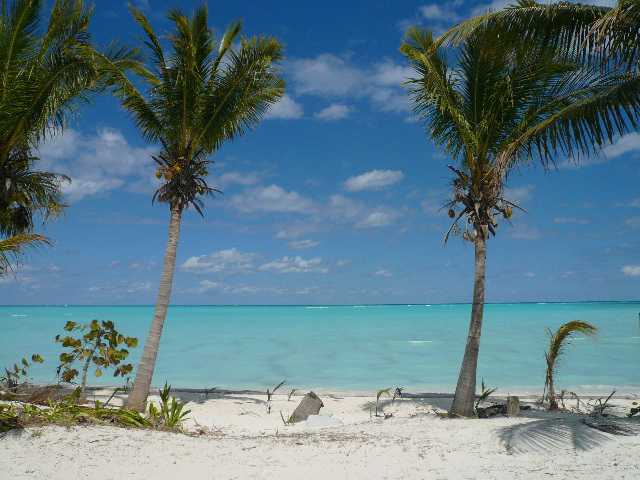 If you want to see the Bahamas the way it used to be, minus the crowds and crime, this is the place to soak it all in and leave the rest of the world behind. If you are a kiteboarder, or enjoy watching this exciting yet graceful sport, you can't get a better location. 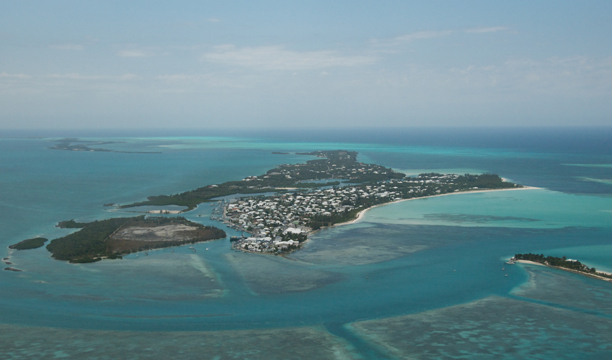 The water and winds are exceptionally well suited for kiteboarding, and it is one of the most sought after locations in all the world for learning and enjoying the sport. Here's a kiteboarding video someone made from our beach. Sorry, NO Smoking and NO Pets permitted.